I based these pancakes loosely on a Chelsea sugar recipe. But as always fiddled with it a bit – in particular I added soda water as part of the liquid component thinking that would lighten them up – it didn't. I'm sure you will have a much better recipe – a foolproof one would be appreciated. Pour the wet into the dry and stir. Don't worry if the batter looks a bit lumpy. Let the mixture stand in the fridge for at least 20 minutes. Then just drop a couple of tablespoons worth into a hot pan – this is the tricky bit – the first one never seems to turn out and the last ones are at risk for burning. The results were ok served with just a sprinkle of sugar, some butter and lemon juice – but I have to admit they weren't as light as I would like. They look delicious, Carole! 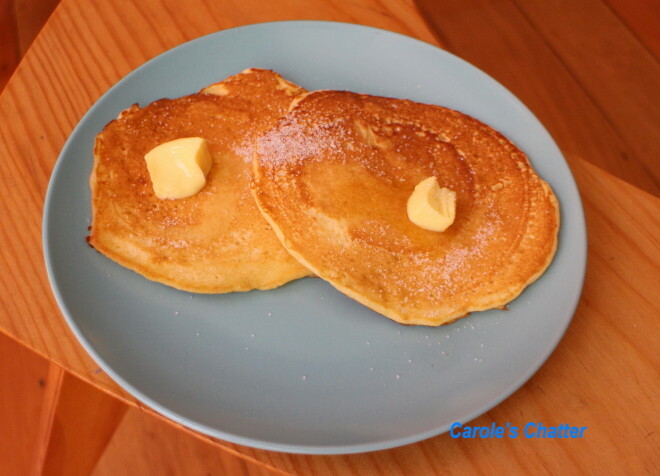 My favorite recipe for pancakes (my own) uses buttermilk - that's the key to light, fluffy pancakes - the buttermilk interacts with the baking soda, making them rise more. I also prefer a mixture of whole-wheat and white flour, and we love to add chopped fruit - or mini chocolate chips! - to ours. I don't make them as often anymore, with my sons grown and mostly flown, but they are still a treat when they are home on a weekend! I use the discard dough from when I feed my sourdough, adding about 1/4 teaspoon soda, an egg and some milk. Of course you would have to adopt a sourdough starter, and feed it occasionally. Now you having me wanting pancakes. My favorite recipe calls for oatmeal and buttermilk. Let me know if you'd like the recipe. I don't have a go-to pancake recipe, but I too use buttermilk and white wheat flour. I love pancakes. I'd try any recipe or eat breakfast at anyone's house for pancakes!